اسلامی فارسانی, رضا, ابراهیم نژاد خالجیری, حسین, خرسند, حمید, عباس بنایی, کوشا. (1393). اثر هیبرید نمودن الیاف تقویت کننده بر خواص کششی کامپوزیت های زمینه اپوکسی. 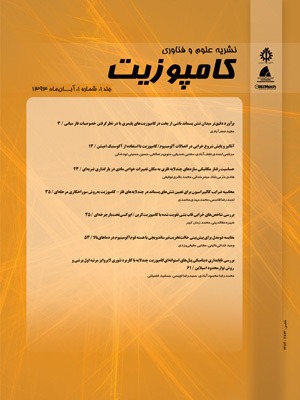 علوم و فناوری کامپوزیت, 1(2), 21-28. رضا اسلامی فارسانی; حسین ابراهیم نژاد خالجیری; حمید خرسند; کوشا عباس بنایی. "اثر هیبرید نمودن الیاف تقویت کننده بر خواص کششی کامپوزیت های زمینه اپوکسی". علوم و فناوری کامپوزیت, 1, 2, 1393, 21-28. اسلامی فارسانی, رضا, ابراهیم نژاد خالجیری, حسین, خرسند, حمید, عباس بنایی, کوشا. (1393). 'اثر هیبرید نمودن الیاف تقویت کننده بر خواص کششی کامپوزیت های زمینه اپوکسی', علوم و فناوری کامپوزیت, 1(2), pp. 21-28. اسلامی فارسانی, رضا, ابراهیم نژاد خالجیری, حسین, خرسند, حمید, عباس بنایی, کوشا. اثر هیبرید نمودن الیاف تقویت کننده بر خواص کششی کامپوزیت های زمینه اپوکسی. علوم و فناوری کامپوزیت, 1393; 1(2): 21-28. Abstract Oxidized Polyacrylonitrile fibers (OPF) are made by thermal stabilization of polyacrylonitrile (PAN) fibers and are used as precursors materials for production of carbon fibers. In this paper, effect of adding these fibers on tensile properties of polymer matrix composites was studied. So thirteen kind weights of epoxy matrix composite reinforced with one of the carbon, Kevlar and glass fabrics including OPF by hand lay up method as four layers with different layering were made. For making of composites epoxy Bisphenol F resin and polyamine hardener were used and the resin to fiber fraction was selected as 60 percent. Then tensile properties and failure cross section of them were studied. Results showed that by increasing OPF to carbon, Kevlar and glass fabric ratio; the tensile and modulus strength decreased but in more than 50 weight percent ratios failure strain increased. Study of the fail cross section showed that composites made with one of the carbon, Kevlar, glass fabrics including OPF have lateral, explosive and edge delamination failure modes respectively and with increasing the OPF to carbon, Kevlar and glass fabric transverse failure mode happens. Schwartz, M., “Encyclopedia of Materials, Parts, and Finishes,” Secend Edittion, Boca Raton, Florida, pp. 8-10, 2002. [2Rahaman, M.S.A., Ismail, A.F. and Mustafa A., “A Review of Heat Treatment on Polyacrylonitrile Fiber,” Polymer Degradation and Stability,Vol. 92, No. 8, pp. 1421-1432, 2007. Johnson, H.D., “Synthesis-Characterization-Processing and Physical Behavior of Melt-Processible Acrylonitrile Co- and Terpolymers for Carbon Fibers: Effect of Synthetic Variables on Copolymer Structure,” MSc Thesis, Virginia University, USA, 2006. Arbab, S. and Zeinolebadi, A., “A Procedure For Precise Determination of Thermal Stabilization Reactions in Carbon Fiber Precursors,” Polymer Degradation and Stability, Vol. 98, No. 12, pp. 2537-2545, 2013. Xue, Y., Liu, J. and Liang, J., “Correlative Study of Critical Reactions in Polyacrylonitrile Based Carbon Fiber Precursors During Thermal-Oxidative Stabilization,” Polymer Degradation and Stability, Vol. 98, No. 1, PP. 219-229, 2013. Sedghi, A., Eslami Farsani, R. and Shokuhfar, A., “The Effect of Commercial Polyacrylonitrile Fibers Characterizations on the Produced Carbon Fibers Properties,” Journal of Materials Processing Technology, Vol. 198, No. 1-3, pp. 60-67, 2008. Badrnezhad, R. and Eslami Farsani, R., “Modeling and Differential Evolution Optimization of PAN Carbon Fiber Production Process,” Fibers and Polymers, Vol. 15, No. 6, pp. 1182-1189, 2014. Xiaomeng, R., Yuansheng, W., Te, H. and Zhengcai, X., “Analysis and Characterization of Orientation Structure of Pre-oxidized PAN Fibers in High Magnetic Fields,” Jounal of Wuhan University of Technology Mater. Sci. Ed, Vol. 29, No. 2, pp. 224-228, 2014. Karacan, I. and Erdog˘an, G., “The Role of Thermal Stabilization on the Structure and Mechanical Properties of Polyacrylonitrile Precursor Fibers,” Fibers and Polymers, Vol. 13, No. 7, pp. 855-863, 2012. Hou, Y., Sun, T., Wang, H. and Wu, D., “Effect of Heating Rate on the Chemical Reaction during Stabilization of Polyacrylonitrile Fibers,” Textile Research Journal, Vol. 78, No. 9, pp. 806–811, 2008. SUN, T., Hou, Y. and Wang, H., “Effect of Atmospheres on Stabilization of Polyacrylonitrile Fibers,” Journal of Macromolecular ScienceR, Part A: Pure and Applied Chemistry, Vol. 46, No. 8, pp. 807–815, 2009. Horrocks, A. R. and Anand, S. C., “Handbook of Technical Textiles, First Edittion, Woodhead Publishing, Cambridge, pp. 25-31, 2000. Smith, W. N., “Flame Retarding Fusion Bonded Non-Woven Fabrics,” US Pat. 4, 970, 111, 1990. McCarthy, T., “Surface Veil of Oxidized Pan Fiber,” US Pat. 2007/0072504A1, 2007. Ogle, S. E. and et al, “Bi-layer Nonwoven Fire Resistant Batt and an Associated Method for Manufacturing the Same,” US Pat. 2005/0233668A1, 2005. Swolfs, Y., Gorbatikh, L. and Verpoest I., “Fibre hybridisation in polymer composites: A review,”Composite Part A, Vol. 67, No. 1, pp. 181-200, 2014. Gasser, A., Boisse, P. and Hanklar, S., “Mechanical behaviour of dry fabric reinforcements.3D simulations versus biaxial tests, ” Computational Materials Science, Vol. 17, No. 1, pp. 7-20, 2000. Kalfon-Cohen, E., Harel, H., Saadon-Yechezkia, M., Timna, K., Zhidkov, T., Weinberg, A. and Marom, G., “Thermal-crosslinked polyacrylonitrile fiber compacts, ” Polymers for Advanced Technologies, Vol. 21, No. 12, pp. 904–910, 2010. Standard Test Method for Tensile Properties of Polymer Matrix Composite Materials, Annual Book of ASTM Standard, 08. 01, D3039/D3039M-00, 2002. Paiva, J. M. F., Mayer, S. and Rezende, M. C., “Comparison of Tensile Strength of Different CarbonFabric Reinforced Epoxy Composites,” Materials Research, Vol. 9, No. 1, pp. 83-89, 2006.